Have you seen those gorgeous tulle skirts floating around Pinterest? You know the ones. They evoke images of princesses and fairies and castles. Okay, maybe that’s just me but how can a girl not feel like a princess wearing something as gorgeous and frilly as this?? 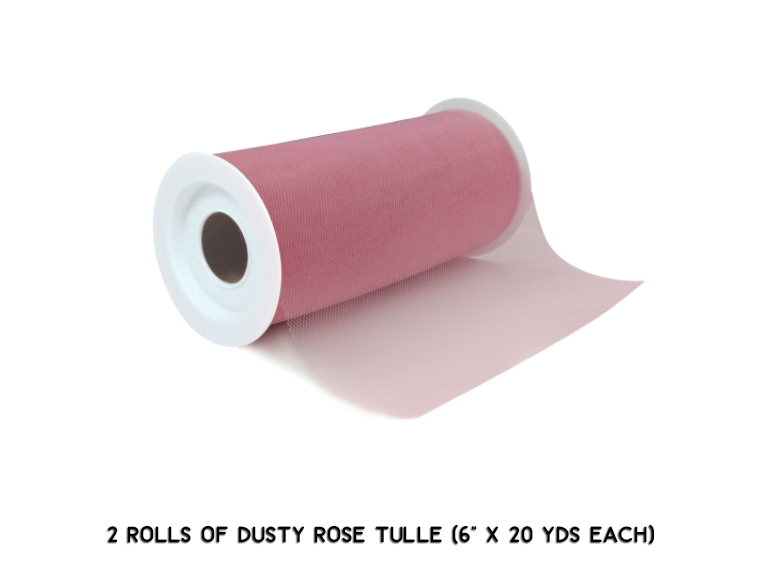 four rolls of tulle (two of each color) I used two rolls of dusty rose and two rolls of fuchsia. Both were purchased at Michael’s in the wedding aisle. pillow stuffing (for heart); You can use plastic bags or tissue if you don’t have any stuffing on hand. 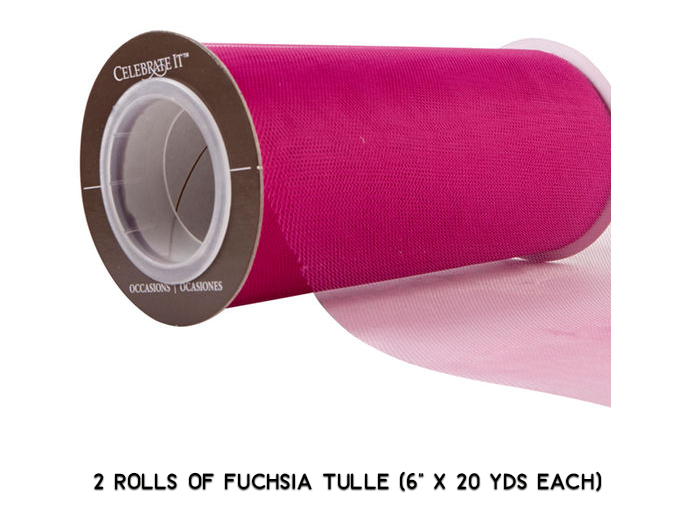 Cut a 6 to 8-inch piece of tulle. Tie it around your wreath form and make a knot. 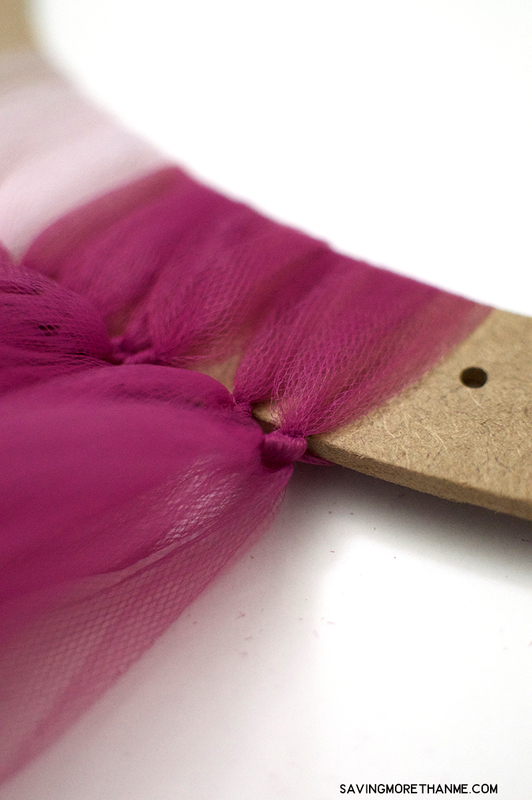 The fluffy part of the tulle should be facing outwards. Repeat. 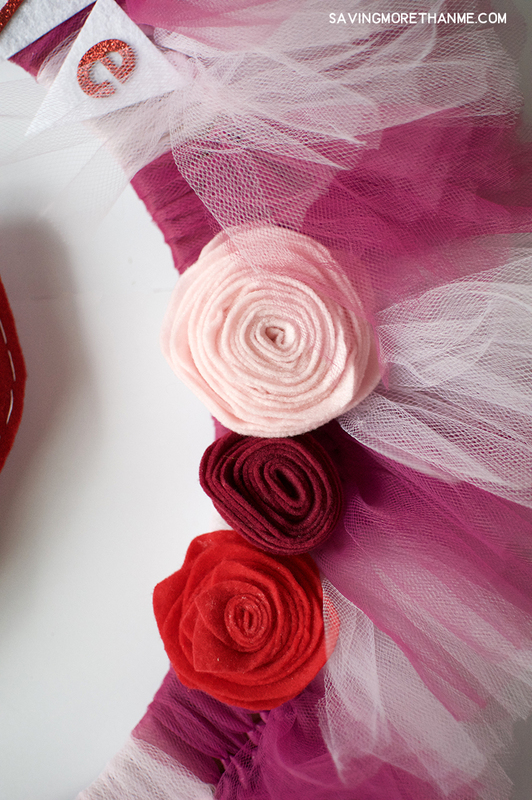 I made four to five rows in one color of tulle and then made four to five rows in the alternate color. Continue this pattern until your wreath form is filled up. 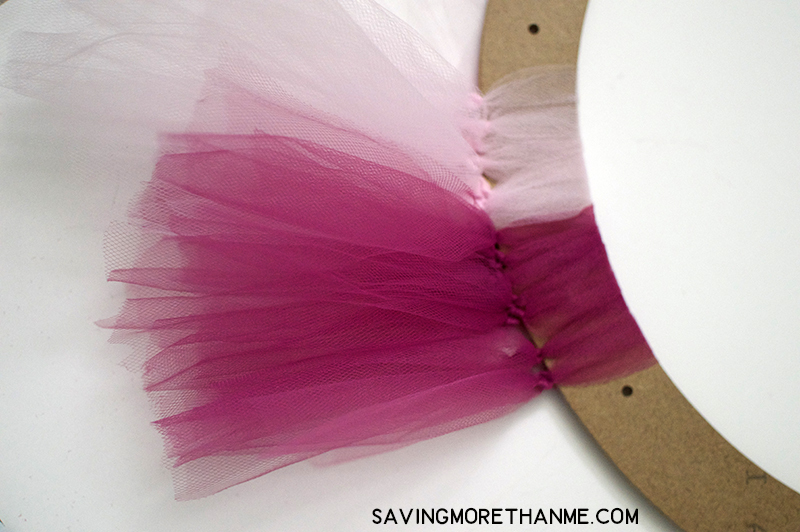 Once done, you can trim the tulle so it’s all one size or trim it so it’s different sizes. It’s up to you. 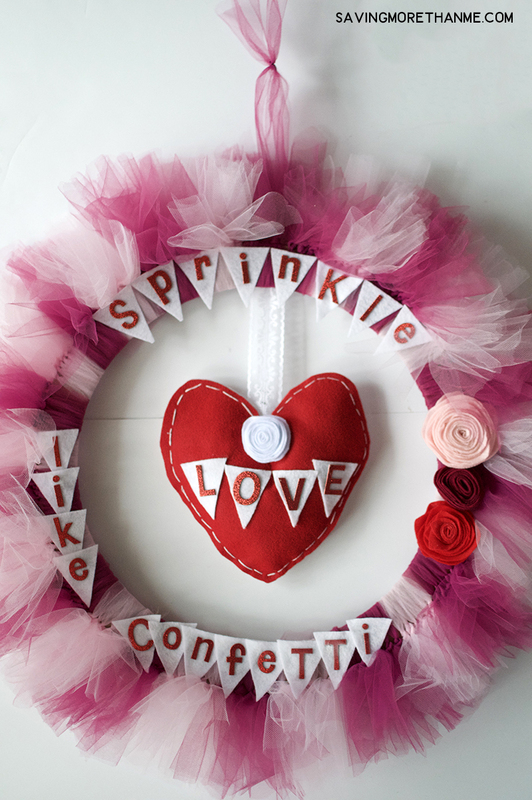 Next, determine what cute phrase you’re going to put on your wreath. 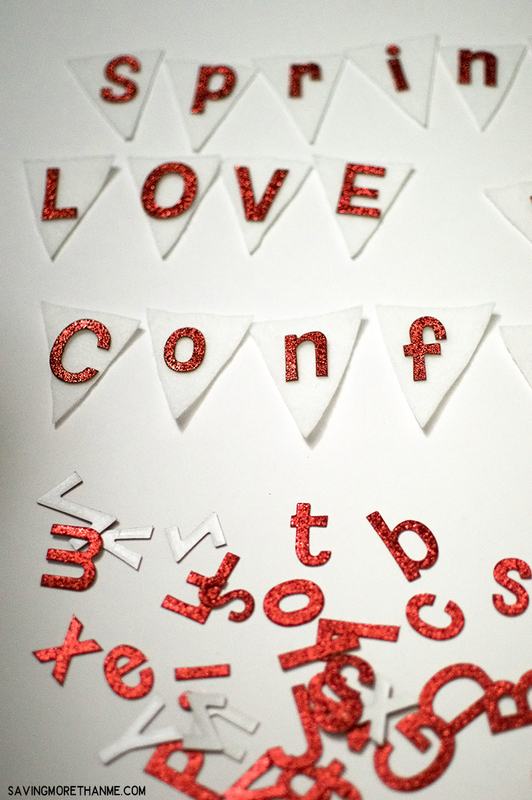 I chose “sprinkle love like confetti.” Using the banner template (download below) and white felt, I cut out enough 3-inch triangles for my phrase. Those triangles are going to be your banner and this is what you’ll stick the red glitter letters to. 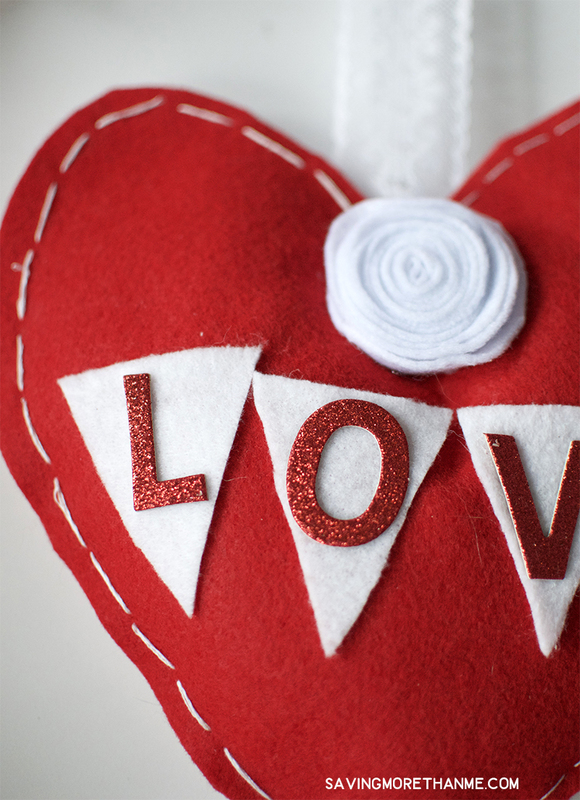 Using the same template linked above, I traced a 6-inch heart onto two pieces of red felt. Using an embroidery needle and thread, I hand stitched the two heart pieces together, stuffed it with stuffing, and then hand stitched it closed. I glued a piece of lace ribbon onto the back of the heart and attached the top of the ribbon to the back of the wreath with glue. 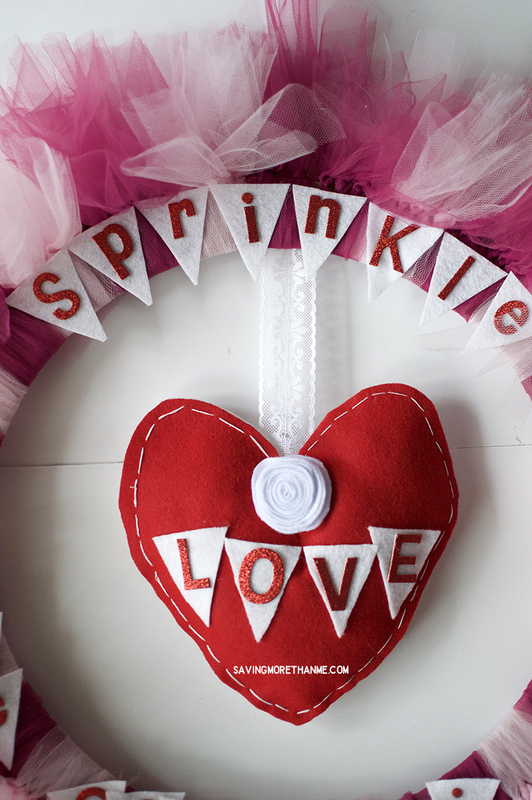 As a result, the felt heart dangles in the middle of the wreath. It looks pretty darn cute. 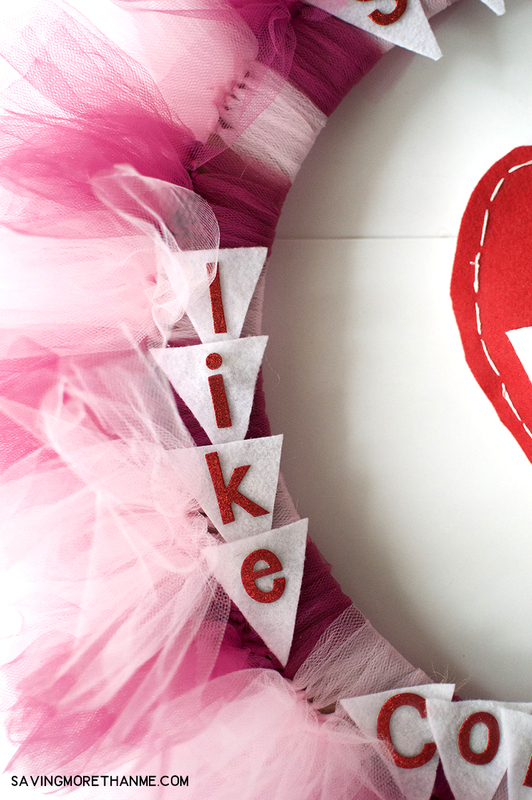 🙂 Next, I attached the “love” banner pieces and added a felt rosette in the top center. This was made using leftover felt from the banner. I laid out the banner phrase onto the wreath to get an idea how I wanted it to appear. When I was happy with the placement, I simply glued each piece onto the wreath. Apparently, the tulle and red glitter weren’t enough for me because I decided to add a few felt roses/rosettes in an open space on the wreath. If you don’t know how to make felt rosettes, do a Google search. 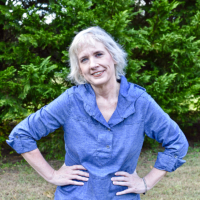 There’s lots of tutorials and videos online that are certainly better than anything my shaky hands could create. A leftover piece of tulle was used to create a loop/hanger for the wreath. 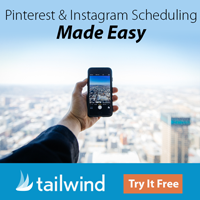 Tie the ends in a knot and call it a day. 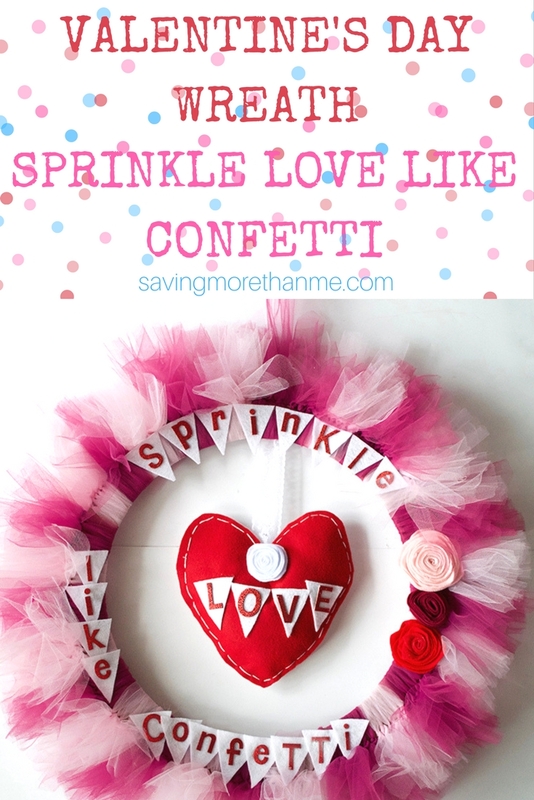 There you have it—a Sprinkle Love Like Confetti Valentine’s Day Wreath. 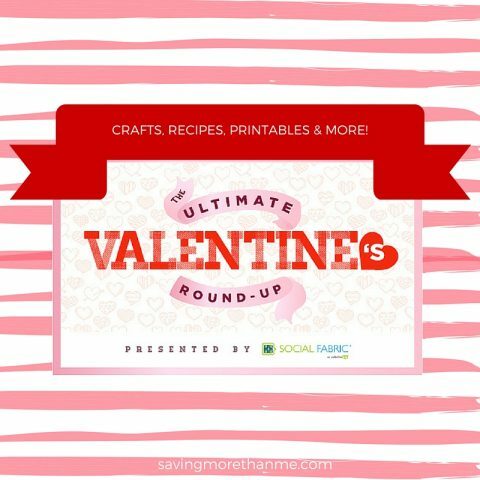 A perfect DIY for a girls night or a snow day. If you like our wreath, will you give us a share on social media? We appreciate it! 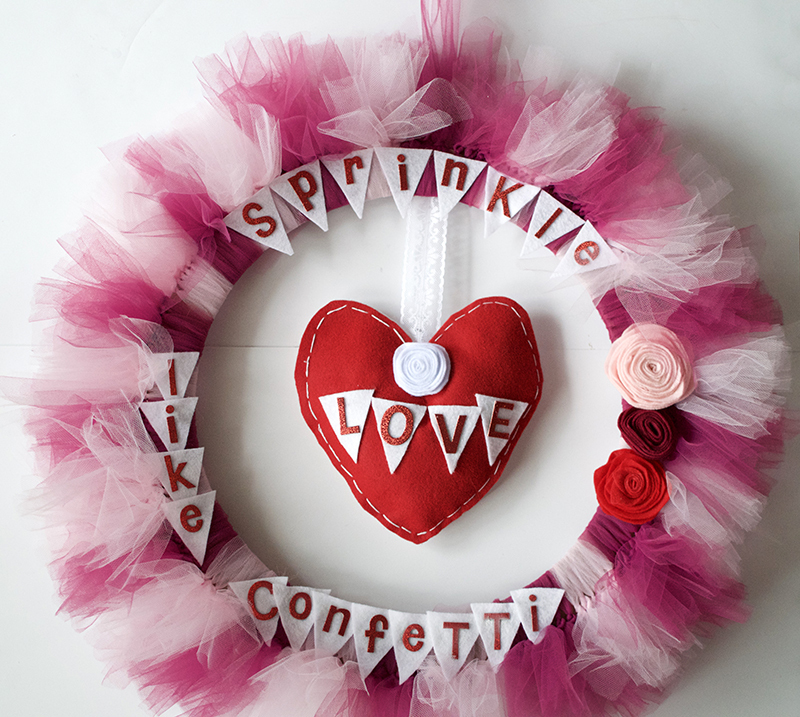 What two colors of tulle would YOU use to make this wreath?